There are numerous types of data structures across programming languages, each with strengths and weaknesses suited to particular tasks. Since R is a programming language used widely for statistical data analysis, the data structures it utilizes were designed with this type of work in mind. In this article, we will learn R data structures which are used most frequently in Machine Learning; for example -vectors, factors, lists, arrays and matrices, and data frames. Each is tailored to a specific data management task, which makes it important to understand how they will interact in your R project. In the sections that follow, we will review their similarities and differences. The fundamental R data structure is the vector, which stores an ordered set of values called elements. A vector can contain any number of elements, but all of the elements must be of the same type of values. For instance, a vector cannot contain both numbers and text. To determine the type of vector v, use the typeof(v) command. Several vector types are commonly used in machine learning: integer (numbers without decimals), double(numbers with decimals), character (text data), and logical (TRUE or FALSE values). There are also two special values: NULL, which is used to indicate the absence of any value, and NA, which indicates a missing value. It is tedious to enter large amounts of data manually, but small vectors can be created by using the c() combine function. The vector can also be given a name using the <- arrow operator, which is R's way of assigning values, much like the = assignment operator is used in many other programming languages. As you will see shortly, the vector provides the foundation for many other R data structures. Therefore, the knowledge of the various vector operations is crucial to work with data in R.
If you know, features that represent a characteristic with categories of values are known as nominal. Although it is possible to use a character vector to store nominal data, R provides a data structure specifically for this purpose. A factor is a special case of a vector that is solely used to represent categorical or ordinal variables. In the medical dataset we are building, we might use a factor to represent gender because it uses two categories: MALE and FEMALE. Why not use character vectors? An advantage of factors is that the category labels are stored only once. For instance, rather than storing MALE, MALE, FEMALE, the computer can store 1, 1, 2, which reduces the size of memory needed to store the same information. Additionally, many machine learning algorithms treat nominal and numeric data differently. Coding as factors is often needed to inform an R function to treat categorical data appropriately. Notice that when the gender data for John Doe and Jane Doe were displayed, R printed additional information about the gender factor. The levels variable comprise the set of possible categories factor could take, in this case: MALE or FEMALE. Notice that when we defined the blood factor for the three patients, we specified an additional vector of four possible blood types using the levels parameter. As a result, even though our data included only types O, AB, and A, all the four types are stored with the blood factor as indicated by the output. Storing the additional level allows for the possibility of adding data with the other blood types in the future. It also ensures that if we were to create a table of blood types, we would know that the B type exists, despite it not being recorded in our data. Machine learning algorithms capable of modeling ordinal data will expect the ordered factors, so be sure to code your data accordingly. A list is a data structure, much like a vector, in that it is used for storing an ordered set of elements. However, where a vector requires all its elements to be the same type, a list allows different types of elements to be collected. Due to this flexibility, lists are often used to store various types of input and output data and sets of configuration parameters for machine learning models. This seems like a lot of work to display one patient's medical data. The list structure allows us to group all of the patient's data into one object that we can use repeatedly. Like the double bracket notation, this returns the list component in its native data type (in this case, a numeric vector of length one). Entire datasets could be constructed using lists and lists of lists. For example - you might consider creating a subject2 and subject3 list and combining these into a single list object named pt_data. However, constructing a dataset in this way is common enough that R provides a specialized data structure specifically for this task. 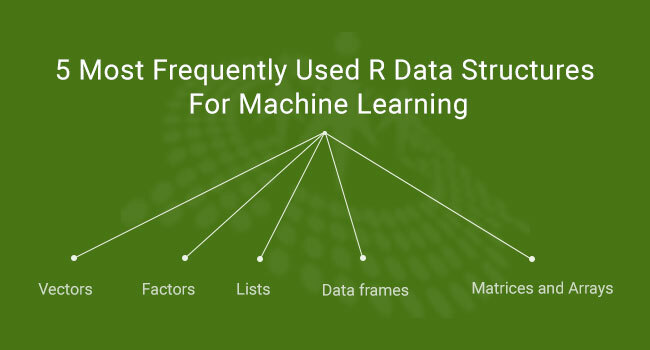 By far, the most important R data structure utilized in machine learning is the data frame, a structure analogous to a spreadsheet or database, since it has both rows and columns of data. In R terms, a data frame can be understood as a list of vectors or factors, each having exactly the same number of values. Because the data frame is literally a list of vector type objects, it combines aspects of both vectors and lists. You might notice something new in the preceding code. We included an additional parameter: stringsAsFactors = FALSE. If we do not specify this option, R will automatically convert every character vector to a factor. This feature is occasionally useful, but also sometimes unwarranted. Here, for example, the subject_name field is definitely not categorical data, as names are not categories of values. Therefore, setting the stringsAsFactorsoption to FALSE allows us to convert character vectors to factors only where it makes sense for the project. Compared to the one-dimensional vectors, factors, and lists, a data frame has two dimensions and is displayed in a matrix format. This particular data frame has one column for each vector of patient data and one row for each patient. In machine learning terms, the data frame's columns are the features or attributes and the rows are the examples. "John Doe" "Jane Doe" "Steve Graves"
When we access the data frame in this way, the result is a data frame containing all the rows of data for all the requested columns. Alternatively, the pt_data[2:3] command will also extract the temperature and flu_status columns. However, requesting the columns by name results in a clear and easy-to-maintain R code that will not break if the data frame is restructured in the future. To extract values in the data frame, methods like those for accessing values in vectors are used. However, there is an important exception. Because the data frame is two-dimensional, both the desired rows and columns to be extracted must be specified. Rows are specified first, followed by a comma and then the columns in a format like this: [rows, columns]. As with vectors, rows and columns are counted beginning at one. To become more familiar with data frames, try practicing similar operations with the patient dataset, or even better, use data from one of your own projects. These types of operations are crucial for much of the work we will do in the upcoming chapters. In addition to data frames, R provides other structures that store values in a tabular form. A matrix is a data structure that represents a two-dimensional table with rows and columns of data. Like vectors, R matrixes can contain any one type of data, although they are most often used for mathematical operations and, therefore, typically store only numeric data. You will notice that R loaded the first column of the matrix first before loading the second column. This is called column-major order and is R's default method for loading matrices. To illustrate this further, let's see what happens if we add more values to the matrix. Closely related to the matrix structure is the array, which is a multidimensional table of data. Where a matrix has rows and columns of values, an array has rows, columns, and any number of additional layers of values. You have read an excerpt from the book Machine Learning with R - Second Edition, written by Brett Lantz and published by Packt. Get a preview of the book here.